Beautiful crochet shawls-wraps for when the evening is getting cooler and you just need something around your shoulders. These 9 gorgeous designs are some that I would wear personally when I am out for a casual event or for that special party, I think they all have a smart style about them that could be worn for most social occasions. 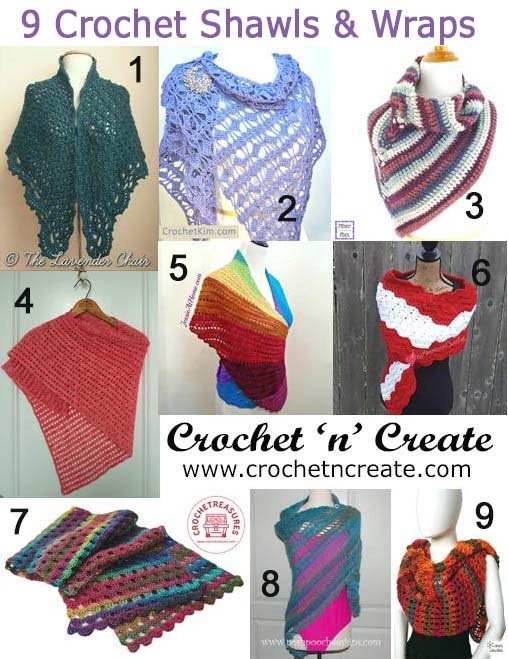 The links to each crochet pattern are below, just click to get the design you want to crochet. Happy crocheting, have fun until next time. This entry was posted in Round Ups and tagged crochet, crochet patterns, crochet roundup, Crochet Shawl, crochet wrap, free crochet patterns on 27th January 2017 by crochetncreate.